Friday was hot and sponsored by the letter “P”. Payrolls were published and Powell made the first speech as the Fed Chair, pushing the price of gold to proliferate. What picture does it paint for gold? Payrolls Disappoint, But So What? U.S. nonfarm payrolls disappointed in March. The economy added only 103,000 jobs last month, according to the Bureau of Labor Statistics, while the markets expected 175,000. That disenchanting increase followed a rise of 326,000 in February (after an upward revision) – actually, it was the smallest gain in six months, as one can see in the chart below. 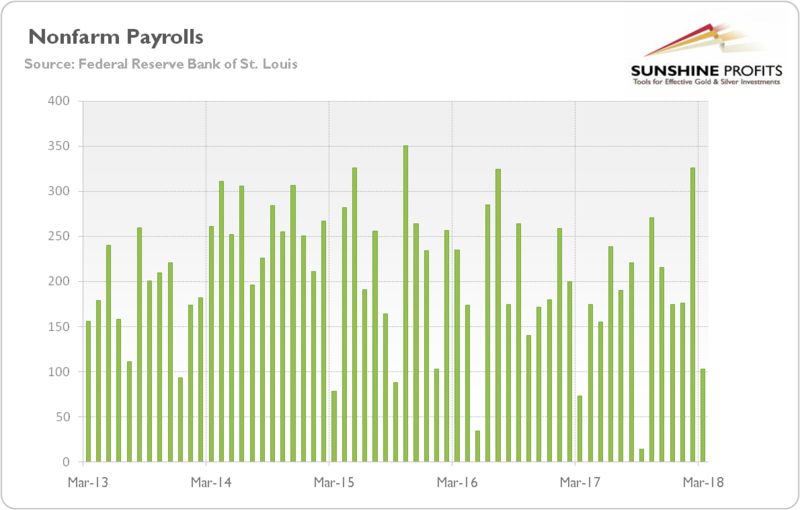 Chart 1: Nonfarm Payrolls (change, in thousands of persons) from March 2013 to March 2018. However, the U.S. labor market remained tight. The unemployment rate stayed at a 17-year low of 4.1 percent. Although a revision subtracted 50,000 job gains, they have averaged 202,000 over the last three months, which is more than enough for the Fed to continue its policy of gradual tightening. Indeed, the U.S. central bank should welcome the recent employment report. The average hourly earnings rose by 8 cents to $26.82, which implies that they have increased 2.7 percent over the year. In other words, the tight labor market is slowly pushing up wages. Hence, although the headline was below expectations in March, the details and the general trend are positive. Gold cannot count on the labor market’s support. NFP Preview: Will U.S. Hiring Bounce Back In June?